Seventeen teachers from across Canada will never teach about the First and Second World Wars the same again. 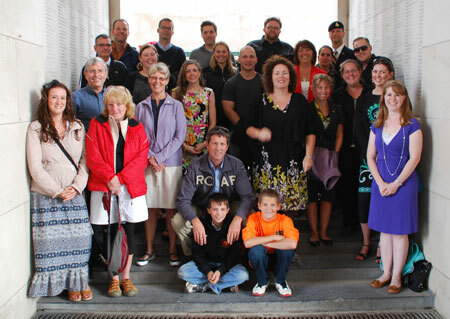 The teachers and prospective teachers, ranging from St. John's to Winnipeg, were part of the Cleghorn War and Memory Study tour of France and Belgium in July delivered by The Gregg Centre for War and Society at UNB and the Laurier Centre for Military Strategic and Disarmament Studies at Wilfrid Laurier University. The two-week program, led by the Gregg Centre’s Lee Windsor, Cindy Brown, and Ontario teacher Blake Seward, visits important sites of the First and Second World War in Belgium and France. The purpose is to challenge conventional ways of thinking and teaching about war by combining the latest historical research and teaching methods. UNB education professor, Alan Sears says several key elements of the tour contribute to its success. "These include the careful balancing of historical information and professional reflection built into tour events and activities; the provision of substantial opportunities for teachers to engage with new scholarship in the discipline of history generally and with regard to Canadian military history in particular; and the sustained and intense nature of the tour community working, talking, and thinking together over two weeks. History teachers rarely get the opportunity for such high quality and professionally transformative educational experiences," Sears said. The teachers' tour program is based on the philosophy of the Canadian Battlefield's Foundation, which suggests that the best way to understand the Second World War is to walk in the shoes of the soldiers who fought it, while also considering bigger questions that commanders wrestled with in planning battles. For Correen Barrett-Smith, a teacher and master's student at the University of New Brunswick, seeing the "soldier's eye view" on the Normandy beaches had a big impact. "We were asked to lay belly down on the incline to obtain a soldier's eye view as they landed and attempted to secure the beach head. You don't realize how limited your view is and how daunting a task becomes with such limited visibility," said Barrett-Smith. For the participants, the tour answered a lot of questions but also left them with some big ones. Dave Alexander, a teacher from Owen Sound, Ont. noted that as a participant, he was confronted with many thought-provoking questions related to this material. "Why does a student need to know this? How should we teach this? Should we trust the textbook's account of this event? Our students will be the beneficiaries of the implementation of these new perspectives and historical thinking skills in the classroom," Alexander added. The tour was formerly under the sponsorship of Historica-Dominion but has been re-established with the generous support of the Cleghorn family and is now available for credit through UNB's faculty of education. For more information, or to apply for the July 2013 tour, please contact Terry Copp, tcopp@wlu.ca, or Lee Windsor, lwindsor@unb.ca.